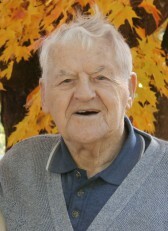 George passed away peacefully Sunday September 2nd, at home, in his 94th year surrounded in love by his family. George was an outstanding husband to Dorothy (nee Johnson), father to Dennis (Sandra) and Michele (Ted), grandfather of Sarah, Mark, Michael Tyler, Ryan, Angelique, and Keegan, great grandfather to Madison, Aurora, and Lily, brother of Anne MacDonald, uncle, and friend to everyone who had the opportunity to share their life with him. He was also the guy who could fix all things broken, an entertaining story teller, a self-taught musician, a passionate sportsman and coach, and above all, a selfless person who spent much of his retirement with Mom and his family, as well as giving back to the community through volunteer work. He was fiercely proud of his children, grandchildren and great grandchildren who all have so many awesome funny memories they will be able to cherish forever. When one lives over 9 decades, they are able to see so many things change in the world and for Dad, he lived through the Great Depression, a World War and other wars, space exploration, the advance of technologies including machinery, transportation and computers. He had a wonderfully long run filled with many rich life experiences including: working in a coal mine in Scotland at age 14, a mental health nurse in an old Scottish castle, a gifted athlete in many sports, helping his parents and siblings emigrate to Canada, and of course, his almost 70 year relationship with our Mom. His family can’t be more thankful for everything he has done for them and their families. He gave them the most valuable thing they could ever ask for…….love and time with his family. In the final months of George’s life, he was not able to enjoy his life to the same extent as he had earlier due to debilitating pain and declining health. Thankfully, he had Mom, Michele, Ted and others to lean on until it was time for him to let go and for his family to carry on his legacy. In his final days, he asked everyone to not be sad, but rather to smile and remember all the wonderful experiences shared where we laughed, lived and learned from our time with him. And he added he will save us a place for each of us when we next see him again. George did not want any funeral service, interment or memorial, but he did want everyone to remember him by having a smile or laugh when you reflect on your memories of him. And if you want to best honour his memory, pay it forward by doing a small selfless act of kindness like holding the door open for someone, buying the person in the Tim Hortons line a coffee, or letting someone go ahead of you in line. And when you do, remember to smile and say “that’s for you George” as that’s how he lived his life. Mom will initially be spending some time away with her family as she adjusts to Dad’s passing. If you wish to share your condolences and memories with her, we’d ask you to please forward them to her email at dorothy.dillon@sympatico.ca and she will respond when she’s able to thank you for your well wishes. Many thanks to Dr. Essak, Dr.Kwok, Camille Lalonde NP , Jennifer and The V.O.N. Day Program, his P.S.W.’s especially Ken and Bev for all their care and compassion in his life journey.